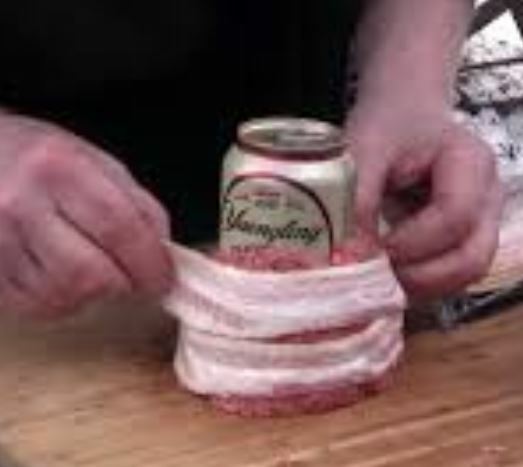 The beer can, or any drinks can, is a tool used to help form a minced beef bowl. Ideally, use an unopened can. Step 1: Take minced meat, season with salt and pepper and, if available, add finely chopped onions and some breadcrumbs and a little egg to the mix (but it’s not essential). Divide the mince into balls. Roughly half a pound in size, a little larger than a cricket ball. Ideally, don’t use lean minced beef as you want fat in the mix to add to flavour and stop the cooked mince from being too dry. Step 2: Press the can down into the mince and shape the mince up the sides forming a meat cup. Wrap this cup with bacon to hold the shape. Hold the cup firmly and slowly pull and twist the can to remove. Hey presto, you have the perfect meat pocket to hold the stuffing of your choice. Mix and match and add your own ingredients. Onions, red and green peppers, garlic and cheese works. If you want a little heat to your burgers, throw in some fresh chopped jalapenos. I particularly recommend garlic mushrooms! Caramalised onions and cheese is a pretty good alternative! 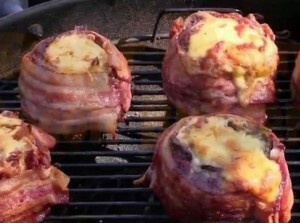 Step 4: Cook them on a grill placed on your campfire. We’ll let the Barbecue Pit Boys from the US show you how craftsmen do it. If you haven’t subscribed to their Youtube channel… I recommend it. After finishing making your burgers, don’t throw away that beer can! Yes, we mean drink the contents but also, why not make your own camping stove!